One of my favorites, this Forest Planting is mainly composed of Musk-Scented Maples, with a Parker’s Jasmine to the far right. 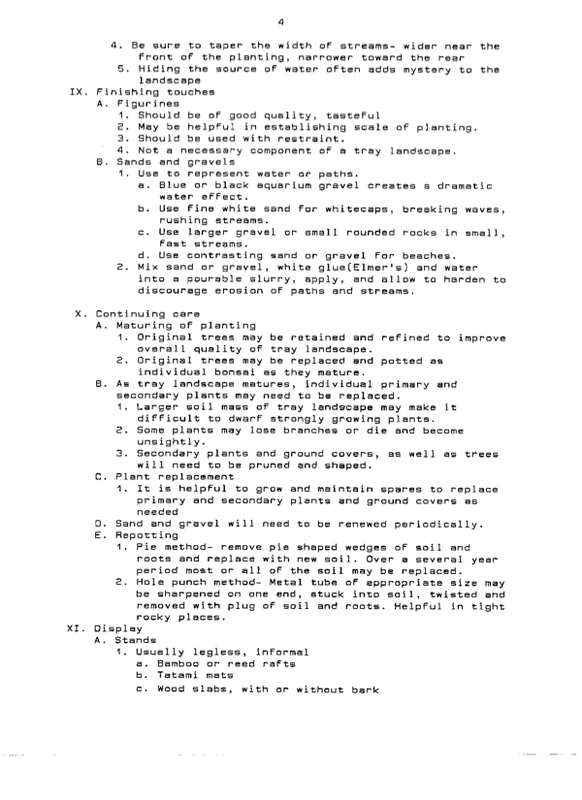 A number of moss species, selaginellas, and lichens form the understory plantings, and it rests on a slab of Colorado granite. 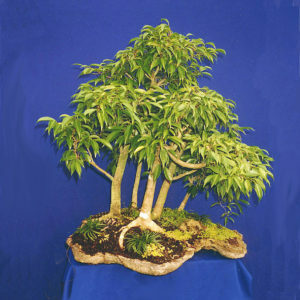 The taller trees are about 6-8″, and were about ten years old and in training when the picture was taken. Traditional bonsai, especially the Japanese variety, could be viewed as straight-laced, tradition-bound, and rigid, clinging tightly to a set of well thought out and time-proven rules. 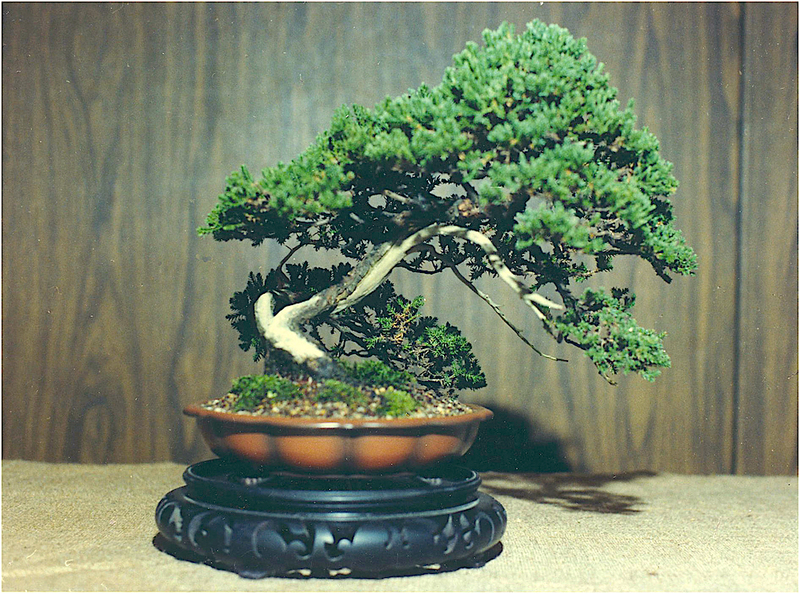 And that has served the Art of bonsai well, producing valuable masterpieces enduring for centuries, in some cases. But sometimes, especially if you have Western sensibilities, a little freedom from the rules, while still keeping the Spirit of bonsai intact, can produce intriguing new works of bonsai Art. 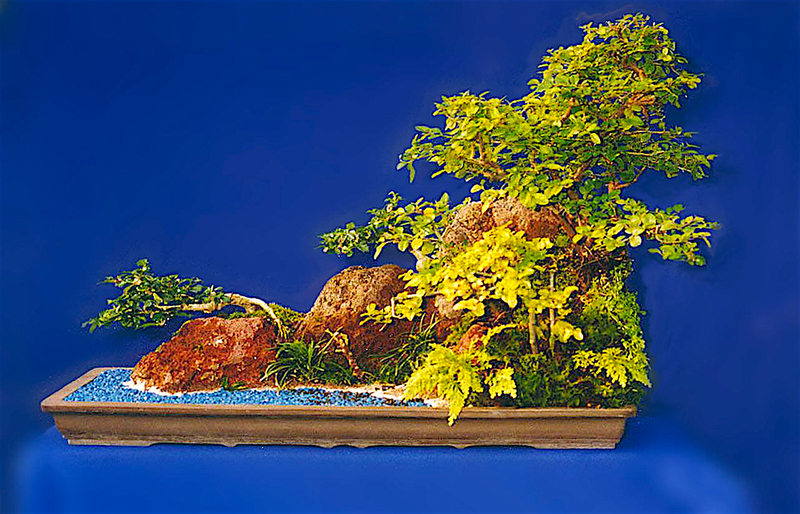 Tray landscapes allow the use of combined plants and rocks that complement each other and produce something greater than the sum of it’s parts, where the individuals might fall short if used as traditional bonsai. 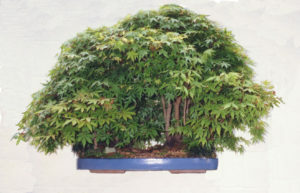 Beginning in China, spreading to Japan, and blossoming in the Americas and Europe, Tray Landscapes have emerged as a legitimate bonsai style. 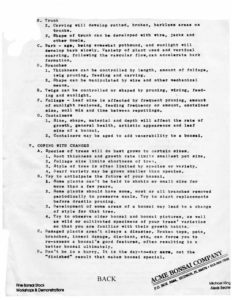 I am proud to have helped push this style forward. 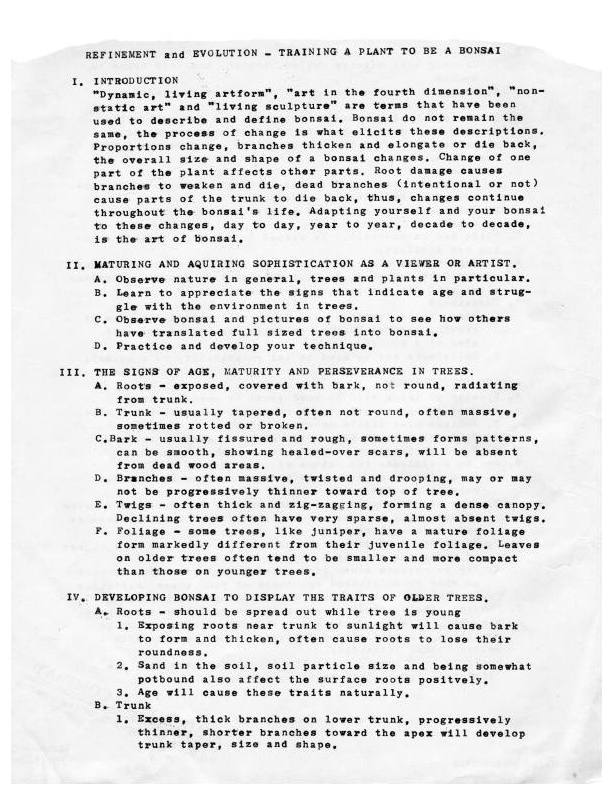 Here is the outline I used in classes and workshops. A Tray Landscape with a tropical theme. Red lava rock is used to suggest a seaside point. 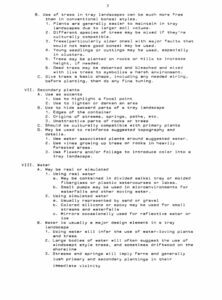 Chinese Sweet Plum and Fujian Tea are the main trees, with Golden Fern, dwarf Mondo, Irish Moss, and other mosses and lichens as secondaries. Blue gravel symbolizes the Sea, while brown and white sands suggest a Beach with breaking waves. A fine quality Japanese pot contains the scene. This Buddhist Pine (Podocarpus maki) was obtained from a nursery. It was damaged and in poor shape. 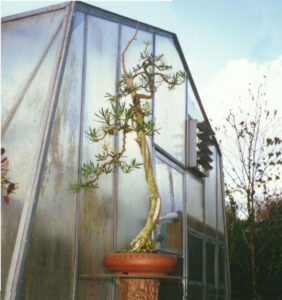 The original plant was spindly and over 5′ tall, the developing bonsai was about 40″ tall in the pot. 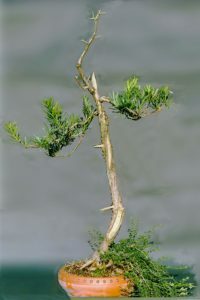 Initially, the top couple feet of the plant was cut off and a deadwood stub was left. The top branch was wired upright, and a spiral of deadwood was cut into the trunk. After a year, or two, the upright branch was killed off and the bark stripped to give it the look of a dead snag at the top of the tree. The branching/foliage you see in the “intermediate” and “after” photos was all developed from the two green branches in the “before” picture. 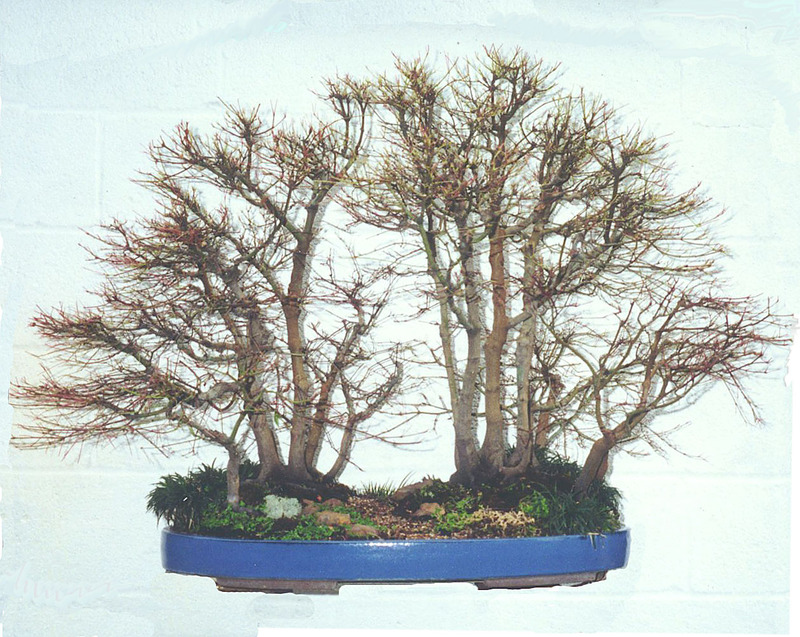 This shaping was accomplished by spiraling wire around each branch and then bending the branch to the desired shape. 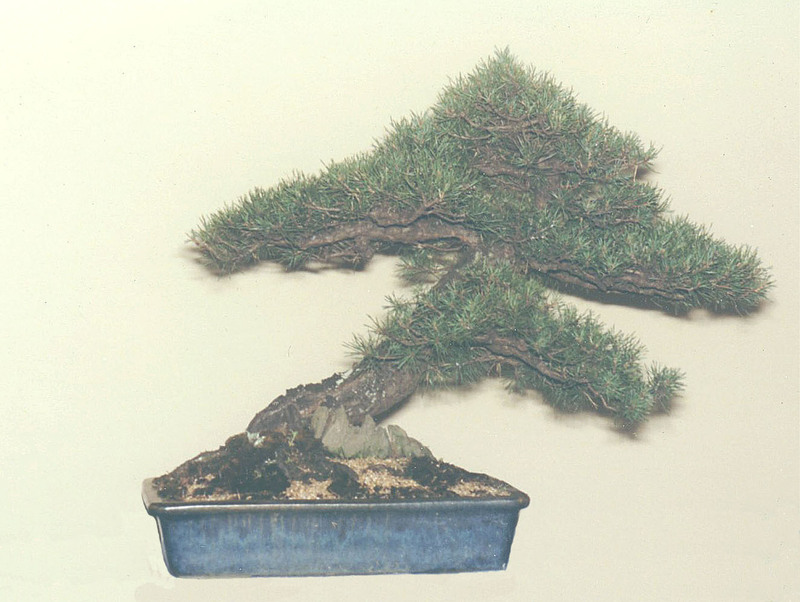 The wire then held the branches in place until they made enough growth to stiffen and become set in that position. 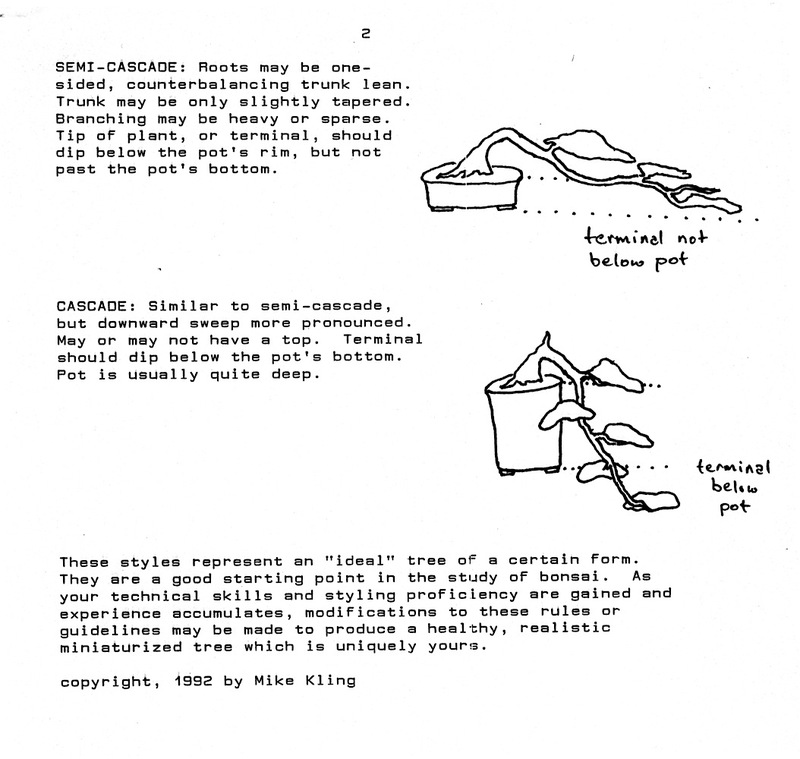 Simultaneously, the green shoots were selectively pruned to force them to bud back and grow denser, smaller foliage. That combination produced the results shown in the “after” photo. 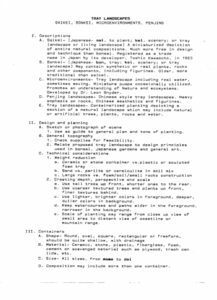 Future development would call for continued pruning to make the foliage even more compact and smaller, while making the masses more rounded and spreading, improving the balance. The spiral driftwood will be expanded by nibbling away at the scar tissue forming at the edge of the living bark, eventually reducing the live bark to a very thin strip. The dwarfed foliage will be thinned and the smaller branches developed in more detail to balance better with the reduced amount of live bark. The driftwood/deadwood effect will be maintained by bleaching and preserving it. 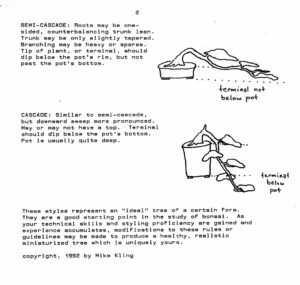 If the live bark stays attractive as it sheds and cracks it will be kept, but it is more likely that it will be peeled slowly to expose the underbark, which is the same color as the pot. 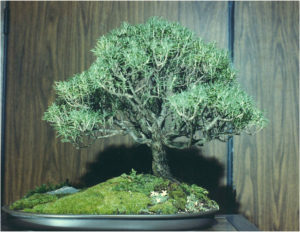 The underbark will be polished to maintain a pleasing texture. These effects will take decades to refine, and the tree could potentially live for centuries in skilled care. 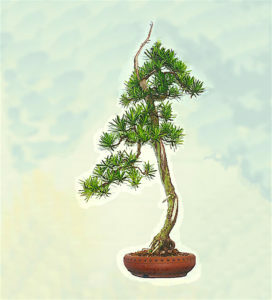 That is the Art of Bonsai. 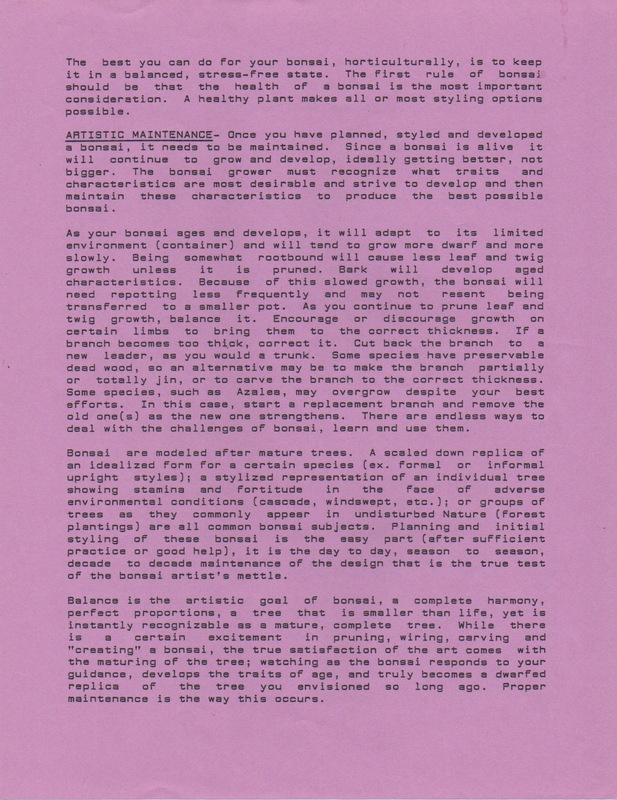 This is a scanned copy of a handout that came with my first advanced bonsai classes in 1988. 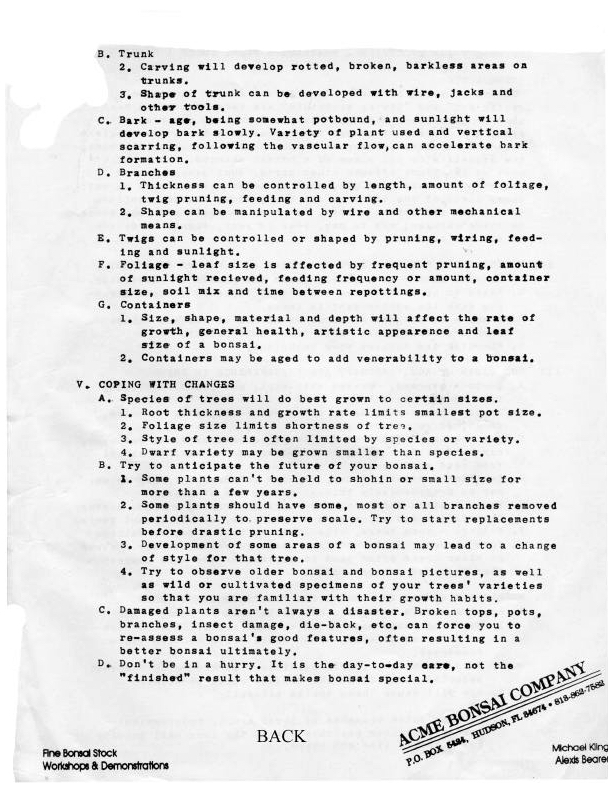 It was originally produced on a manual typewriter. Bonsai is the art or process of dwarfing a woody plant by limiting it’s environment (just as Nature does in some circumstances) and by physically manipulating it to emulate full sized trees, in miniature. 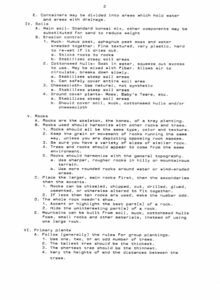 There is a lot of information in this small handout, if you think about and expand the ideas presented in it. 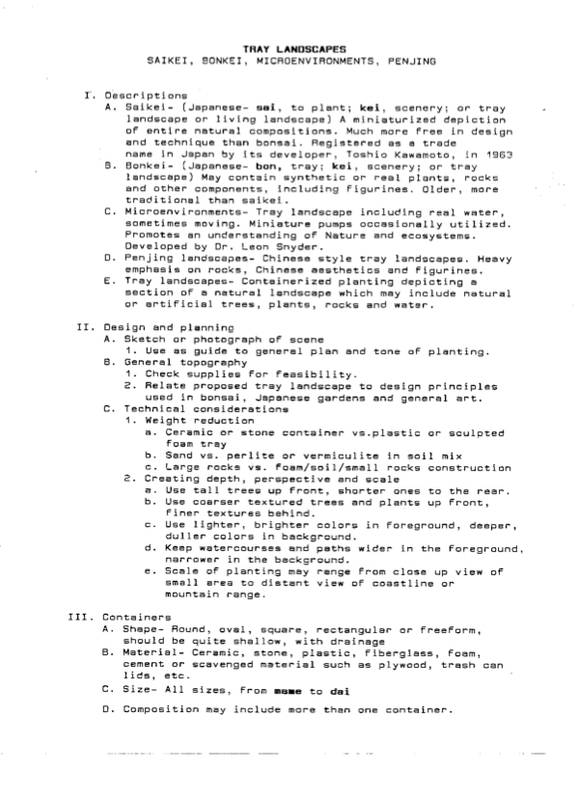 These guides were originally made with a typewriter (toldya Bonsai is an Ancient Art). 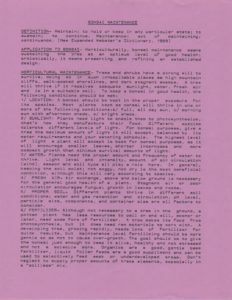 They were scanned from printed copies and are technically pictures. 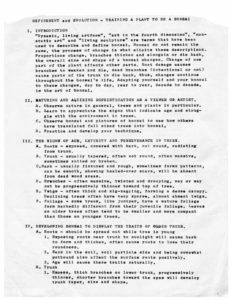 Click one to enlarge it, then click the white circle in the upper right corner to further enlarge it to read. 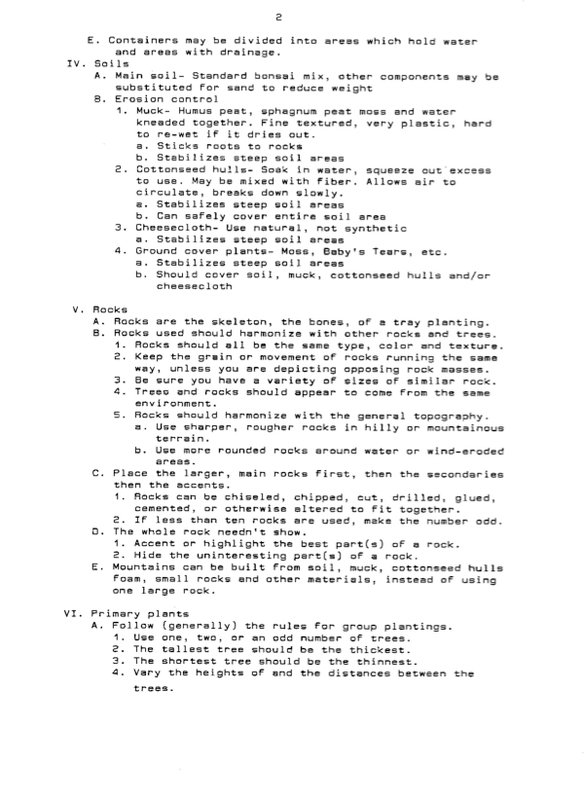 These are the Basics, in a highly condensed form; seeds to grow into thoughts. 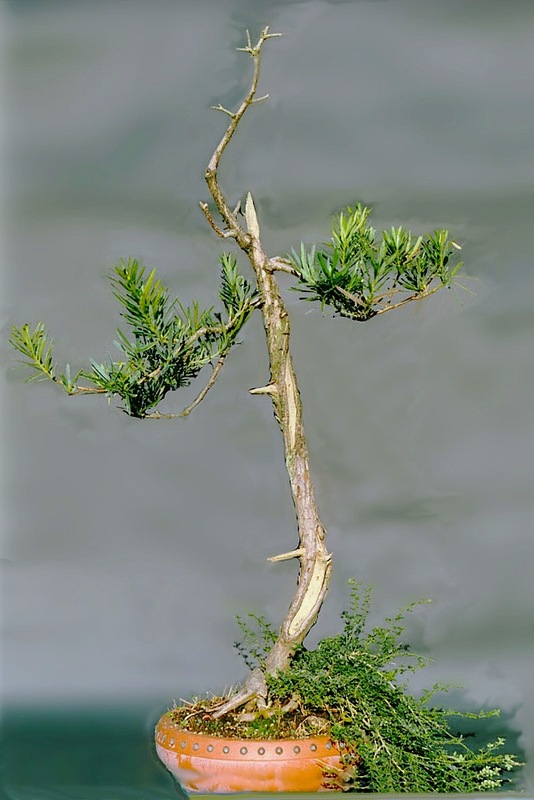 Dwarf Japanese Garden Juniper, trained for a few years from nursery stock. 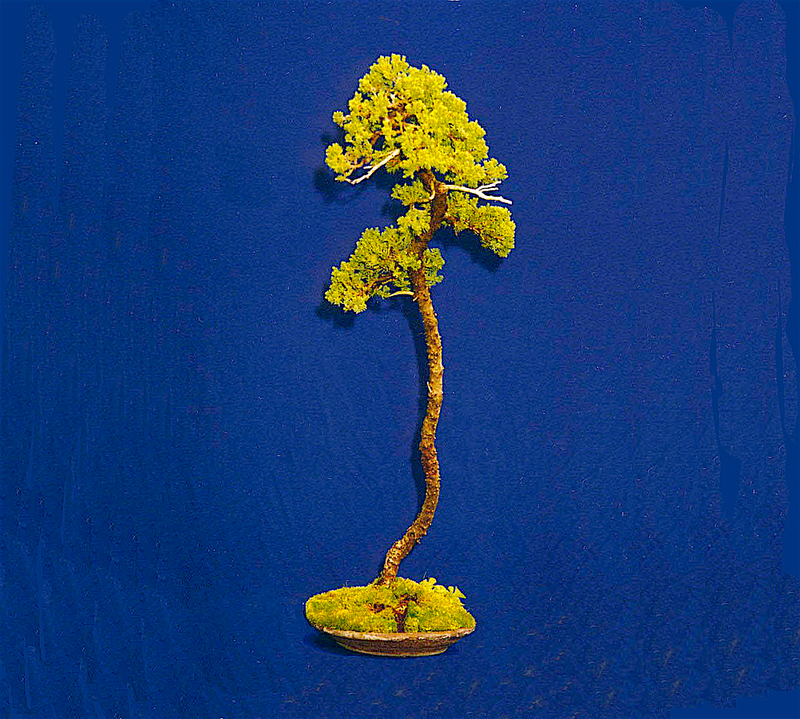 Modeled after wind sculpted Mountain Trees, this youngster already has some deadwood development. 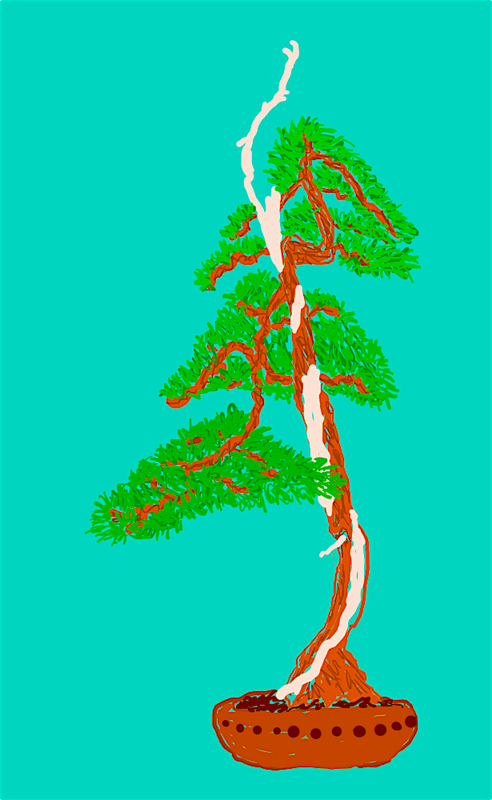 The branches need much work. 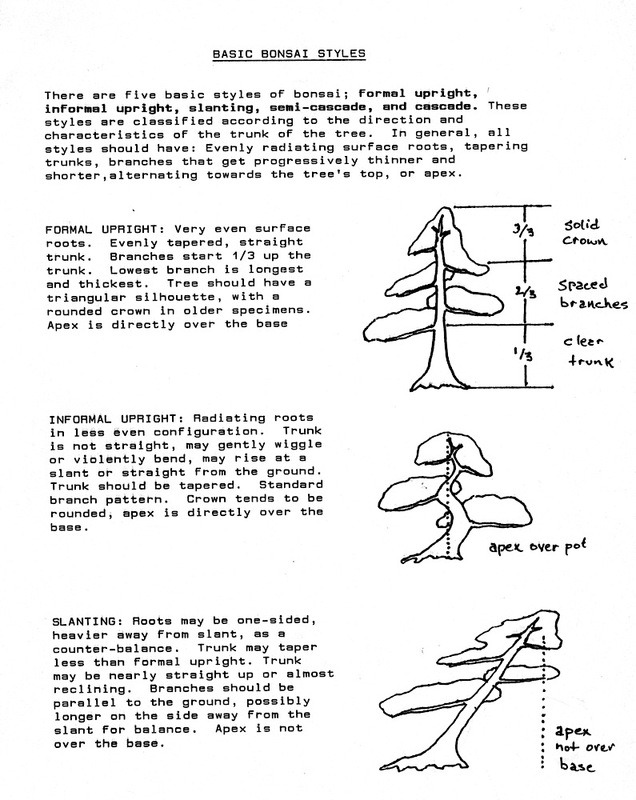 The canopy is sketched in, now individual branches should be thinned and developed. It is somewhat incongruous for the tortured trunk to support such lush growth. As the branches are reshaped and thinned to fill in the canopy, some will be killed off for more driftwood throughout the tree. 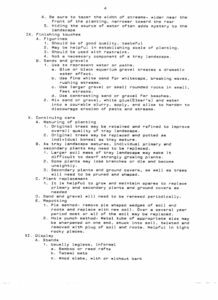 Here’s a handout from my Beginning Bonsai Classes. The Art of Bonsai begins by classifying miniature trees into these five basic styles. 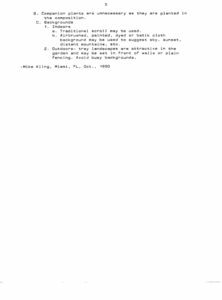 There are an infinite number of substyles that derive from these. 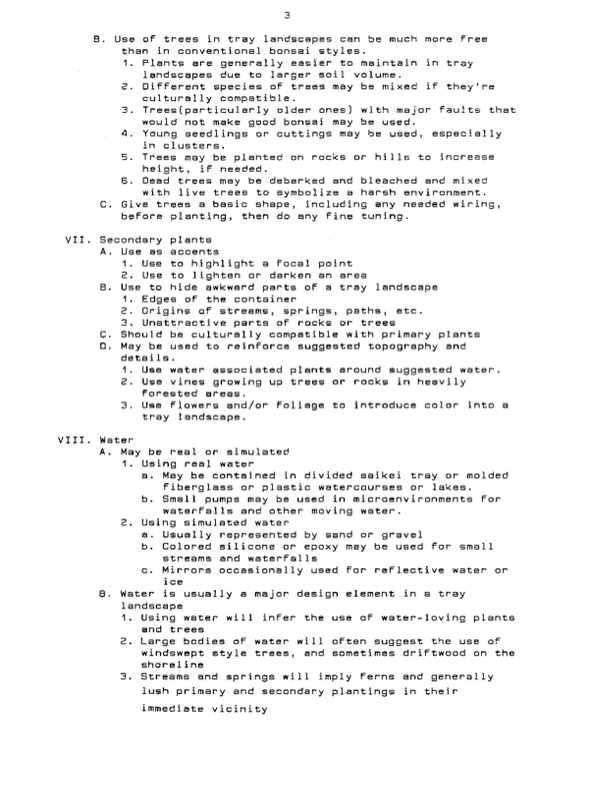 These guides were originally made with a typewriter (toldya Bonsai is an Ancient Art) and hand drawn illustrations. 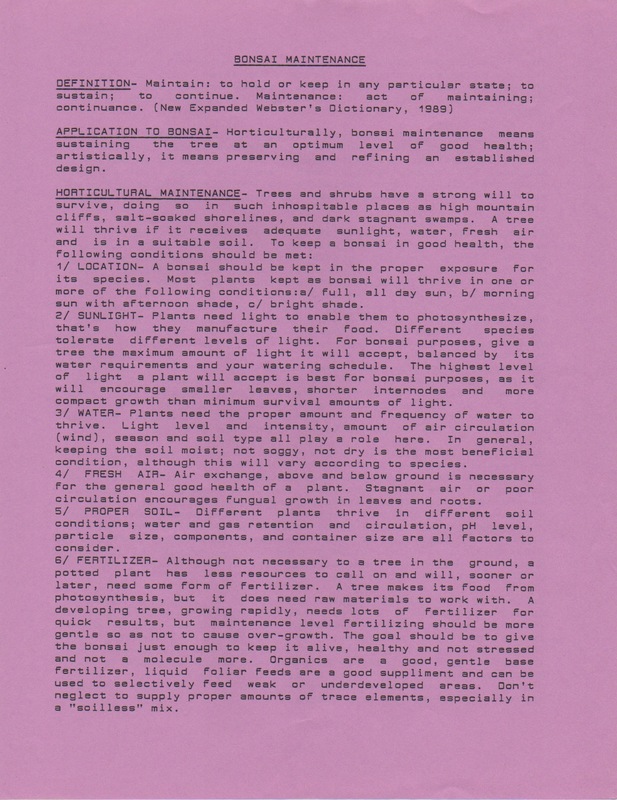 They were scanned from printed copies and are technically pictures. 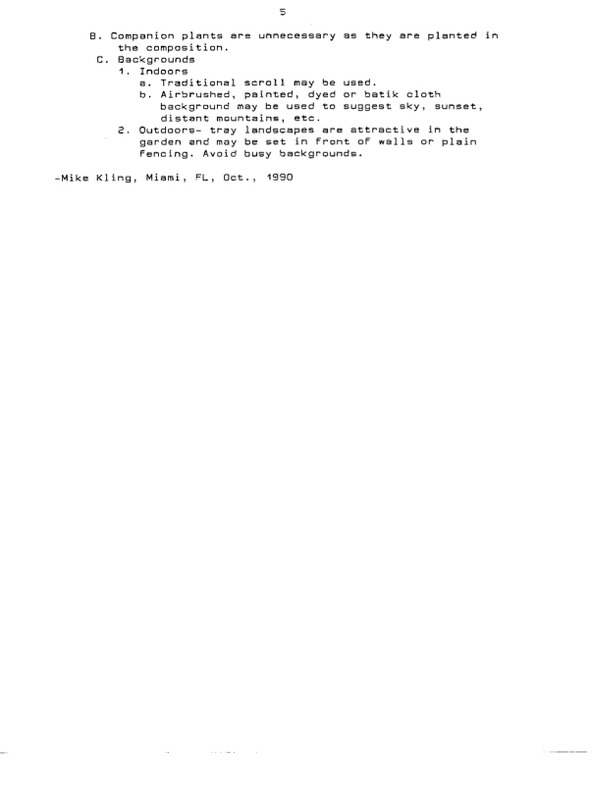 Click one to enlarge it, then click the grey box in the upper right corner to further enlarge it to read. Florida Hornbeam, aka, Ironwood. 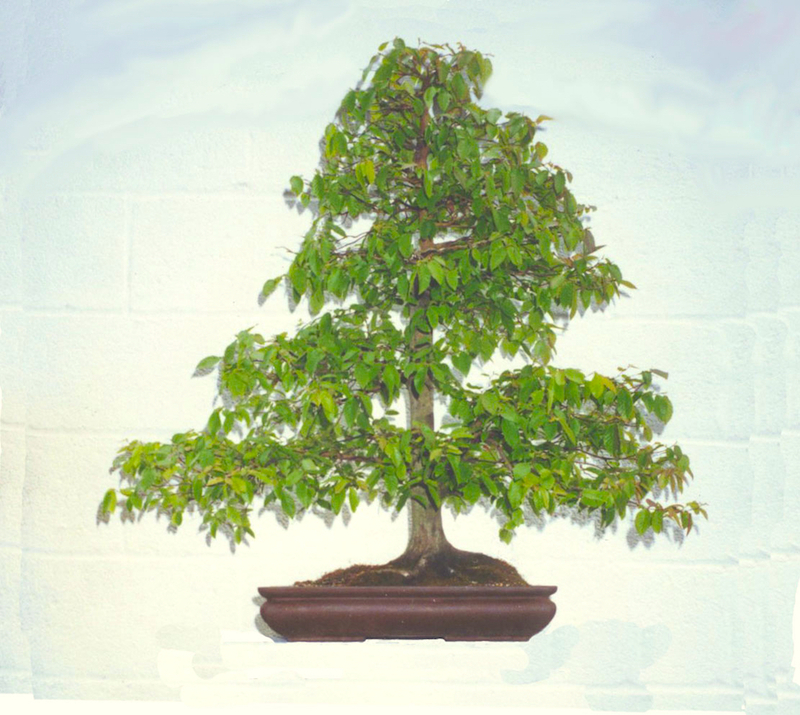 Originally collected from the swamps of North Central Florida as a young tree, it was reduced in height to make the trunk appear thicker. Hornbeams have smooth, muscular grey bark, delicate twigging, and nice Fall Color, all of which will be developed and refined in the future. It is being trained in the Formal Upright style. 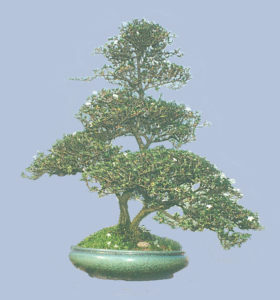 Bonsai is the Practice of keeping a Dwarfed Tree in a Pot. It is the Art of Distilling the Essence of a Tremendously Old Forest Monarch into a Liftable Miniature, the Expression of Admiration of the old Pine tree hanging off a cliff, Surviving centuries of snowload and withering winds. “A Universe in a Pot”, “The Backdoor to Zen”, the Japanese have said. I concur. It is what i did for many years. A stranger once surveyed my bonsai exhibit at an Art Show and said, “This is your Religion, isn’t it.”. I had never thought in those terms, but could not disagree with the sentiment. I stopped the physical practice of bonsai a while back, but not mentally. 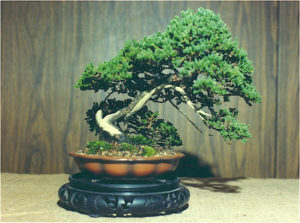 Bonsai gave me an intense admiration for the Arts contained in Nature, and showed me how to find them. 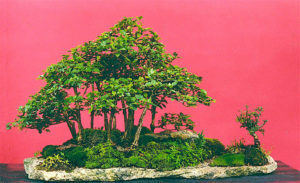 It is a shame that the Western World looks at bonsai but cannot focus it’s superficial gaze. C’est la vie. 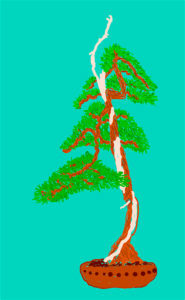 I taught bonsai for several years, too. 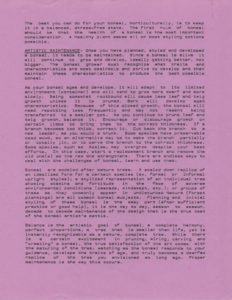 I’ll post up some of my handouts and course outlines, perhaps they’ll be of help to someone wishing to explore this Ancient Art. 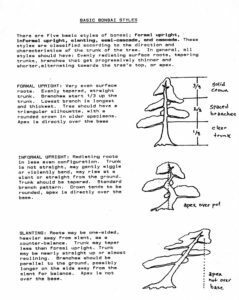 Bonsai is an Art, however, it’s first rule is that the subject plant must be Healthy so that you may safely train it into an Artistic Shape. 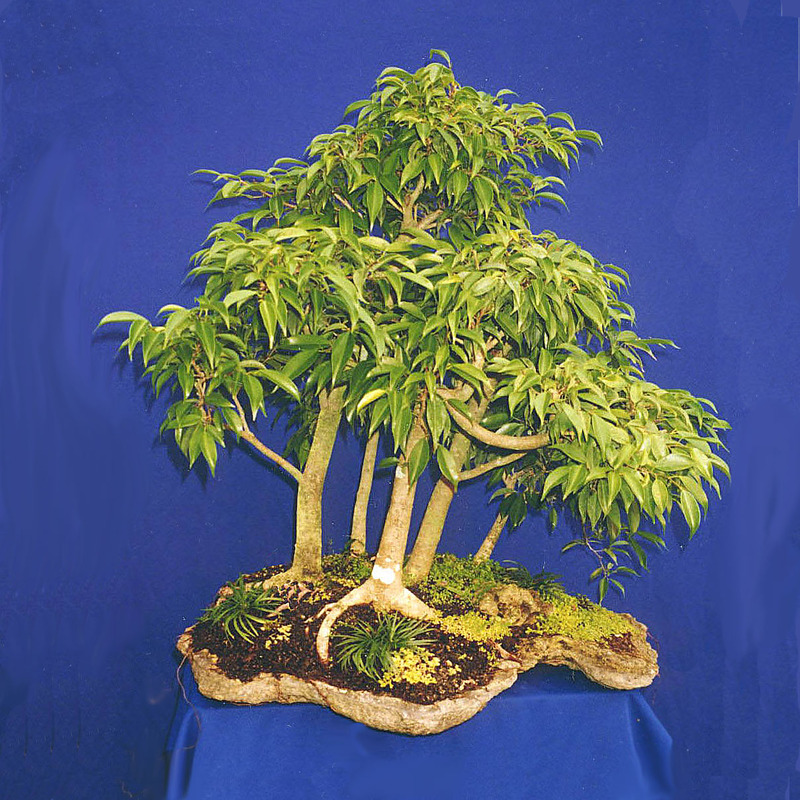 Basic Bonsai Styles addresses the Artistic foundation of Bonsai. From my Beginner Class. 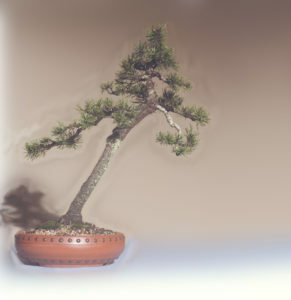 Refinement and Evolution- Training a Plant to be a Bonsai. 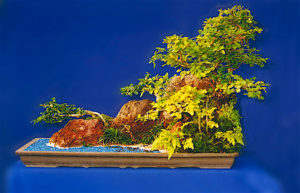 This is where to go and how to get there once your styled Bonsai is comfortably maintained in a pot. It is the Lesson without an End, from my Advanced Class. Bonsai, having been practiced in China and Japan for a millennium, has spawned some companion arts, among them bonkei, saikei, and forest/grove plantings, which may be combined and called Tray Landscapes in the West. Here’s where you can see the outline from my Tray Landscape Classes.